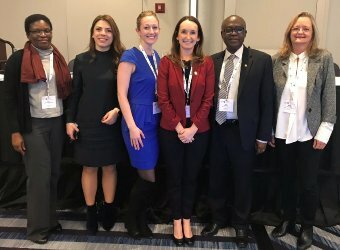 Dr. Elsie and Some Participants at CUGH ConferenceDr. Kiguli-Malwadde presented in a panel titled ‘Diversifying the Global Health knowledge pipeline. The various aspects on how to increase the participation of Women in Science, Technology, Engineering, Mathematics and Medicine (STEMM) were discussed. It was interesting to note that the participation of women in STEMM worldwide was low although in some developing countries it is more marked. 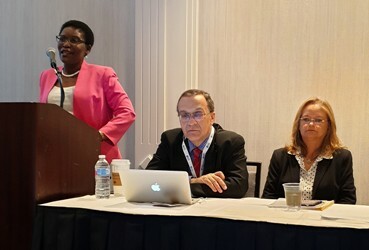 Dr. Kiguli-Malwadde highlighted that it was imperative that diversity and inclusivity be improved across all aspects of the production of the global health knowledge pipeline – from the recruitment and retention of women and minorities into research careers, to participation in peer review and publishing that reflects the gender and geographic breadth of global health research. Barriers to the recognition, participation, visibility & advancement of women especially LMIC women was noted, including penalties for motherhood, un-conducive graduate research environments, lack of support for leadership bids, and fewer promotions and resources as well as exclusion of women from the “old boys' club” of science and medicine that nurture the fraternity, networking, and promotion of men. The commitment of the Lancet to improve diversity in publishing was affirmed. There was a plenary on mental health showcasing progress and challenges in Global Mental health. It was noted that when it comes to mental health, all countries are developing countries. Emphasis on the need to reduce stigma, give supportive care to the mentally ill, prevention and promotion strategies as well as integrating mental health in Primary Health Care cannot be over emphasized. There were over 39 exhibitors and many special group meetings on the side as well as award ceremonies for distinguished achievers. It was an opportunity to collaborate and address challenges ranging from climate change, environmental degradation, non communicable and infectious diseases, governance, inequality, human rights among others.